Indian Bhel has been one of my all time favorite snacks to eat. But it is high calorie and I have been wanting to make a healthier option. 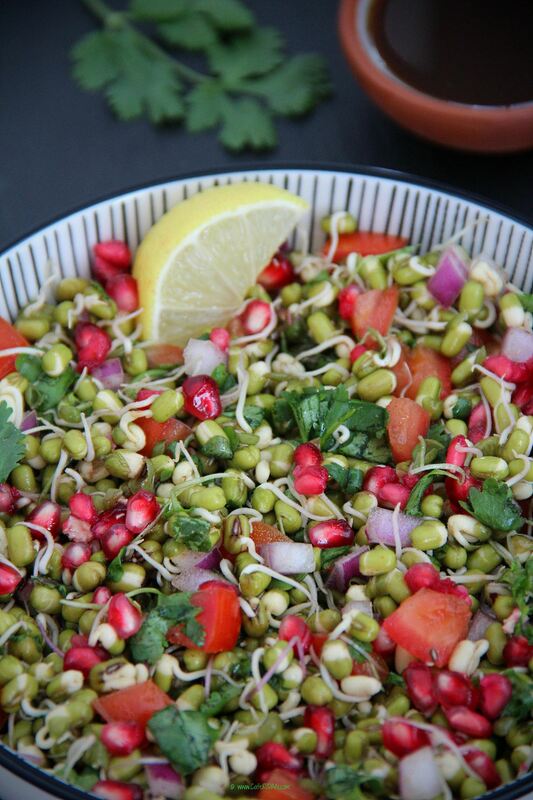 This sprout salad or sprout bhel is the answer…It is delicious, healthy, versatile and so easy to put together. This salad is great for breakfast, lunch or a snack anytime of the day. 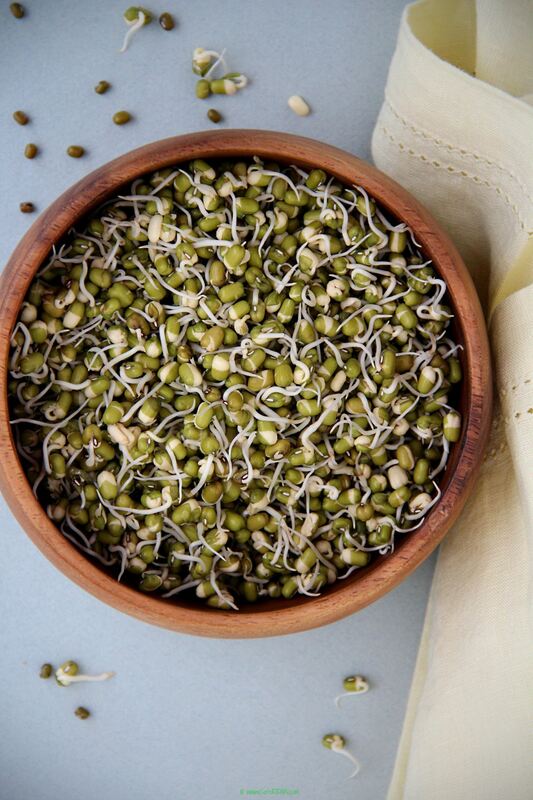 Sprouts are very easy to make at home and they stay in the refrigerator for 4-5 days. I make many variations to this salad. Use a different kind of lentil sprouted or add cilantro chutney. I also add a bunch of other veggies like cucumbers, bell peppers and boiled potatoes…it really depends on what you like. I prefer to eat my sprouts raw but you can boil them for 5-7 minutes to soften them slightly. Wash and soak green moong dal in six cups of water for 24 hours. After 24 hours drain the water and rinse the dal well. Line a colander with a damp muslin cloth and loosely wrap the dal in it. Cover the colander with a lid and leave it in a warm place for 24 – 48 hours depending on how long you want the sprouts to be. I like to eat the sprouts raw but you can also boil them for about 5-7 minutes to soften them a little before using. 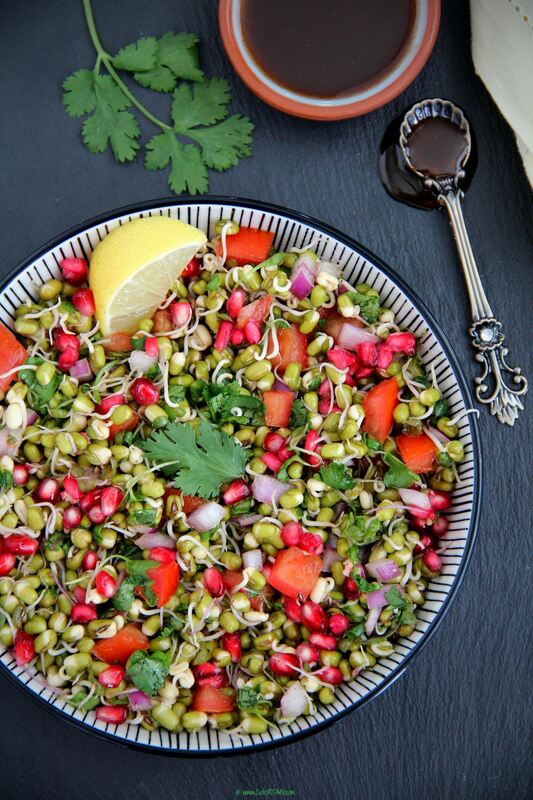 In a bowl add one cup of the sprouts along with the tomatoes, onions, pomegranate seeds, cilantro, micro greens, tamarind chutney, chili powder, cumin powder, salt and a dash of lemon juice. Mix well and serve.